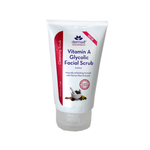 Derma E Vitamin A Glycolic Facial Scrub effectively exfoliates dull, tired cells and removes impurities from the skin's surface for a refreshed, healthy glow. With Vitamin A, best known as the skin vitamin, and deep cleansing, purifying marine plant extracts, this revitalizing formula reveals a radiant, smooth, younger looking complexion. Apply a small amount to wet or dry skin and gently massage in circular motions. Rinse thoroughly with warm water and pat dry. 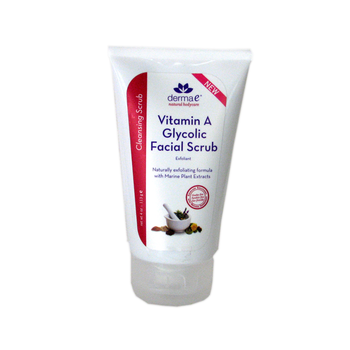 Water aqua, cetyl acoho, stearic acid, decyl glucoside, prunus armeniaca apricot seed powder, hydoxypropyl starch phosphate, glycerin, polysorbate 60, cetearyl alcohol, retinyl palmitate vitamin A, ascorbyl pamitate c-ester, tocopheryl acetate vitamin e, carica papaya fruit extract, organic calendula officinalis flower extract, organic cymbopogon schonanthus lemon grass extract, equisetum arvense horsetail extract, macrocystis pyrifera sea kelp extract, glycolic acid, panthenol, gluconolactone, sodium bensoate, natural and frangrant oils.